As a senior, you need about as much sleep as younger adults about eight hours per night. However as an individual, you many need more or less sleep depending on several factors. Certain conditions, medical or otherwise, can prevent you from going right to sleep right away or may have you getting up once to several times per night, so you may not get the quality or quantity of sleep you need all at one time. 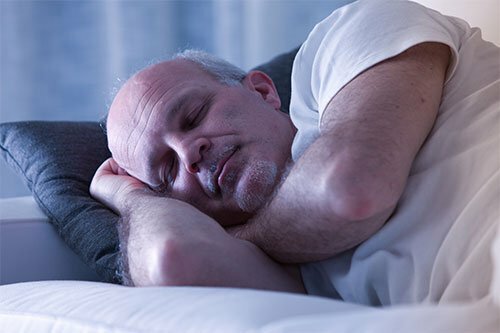 Chronic pain, prescription medication side effects and frequent urination are all common reasons for sleep interruption among seniors. However, usually your doctor can help alleviate some symptoms or at least reduce the effects so that you can sleep better. When at the doctor the next time, mention the problems you are having as far as getting a good night’s sleep. Another common cause of sleep deprivation can be the conditions in your bedroom. When did you last replace your mattress? If the one you have now is over eight years old, it is time to get a new one. The same with your pillow. It too may also need replacing. Mattresses and pillows both break down over time and can cause aches and pains that prevent you from getting the sleep you need. Also make sure your bedroom is at a comfortable temperature. Being too hot or too cold can interrupt your sleep pattern too. What happens if you don’t get enough sleep? Your body can react in several different ways. Common mental issues include impaired concentration, lapse of memory, anxiety and depression. Physical issues can include weight gain, diabetes, hypertension, heart disease and immune deficiency. If you are not getting the amount or quality of sleep that you should, there are several things you can do to improve your sleeping besides adjusting the room temperature and replacing your pillow and mattress. First, get into a routine of going to bed about the same time each night. This tends to get your body into a circadian rhythm where over time, it will expect you to be ready to go to sleep at a certain time and will make body function adjustments accordingly. Second, exercise. By exercising for at least 30 minutes most days, you can help prevent gaining weight, which can also prevent the other common physical reasons for not getting to sleep right away … diabetes, hypertension and heart disease. Third, limit your eating and intake of alcohol to no later than three hours before going to bed. If your body has to work at processing food or drink, it cannot go into a rest cycle and ends up keeping you awake. Finally, don’t overlook a mid-day nap of an hour or so to help you recover some of the time lost of not sleeping at night. It will help reduce your sleep deficit and can leave you feeling refreshed and recharged.